Barefoot, a cup of coffee on hand; I glided past a midsized replica of Juan Luna’s Spoliarium to have my coffee at a veranda somewhere in Vigan City. Earlier, I passed by masterpieces from BenCab and Amorsolo; not replicas, but originals. 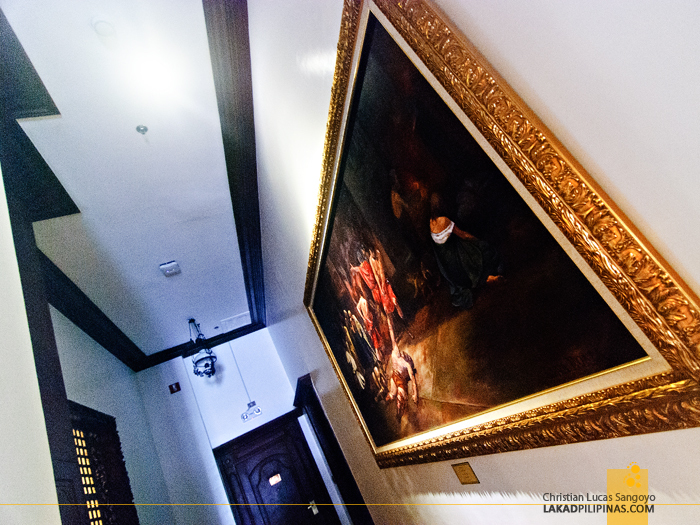 And yeah, it also took me a while to get my eyes off a supposed Juan Luna original painting. The original plan was to get back home after touring the only hotel slash museum of its kind outside Metro Manila. We’ve been passing by Hotel Luna every single day we were in Vigan City, but for one reason or another, we always fail to visit its halls. On our supposed last day in the city, we made it a point to finally enter its door. And our jaws dropped. 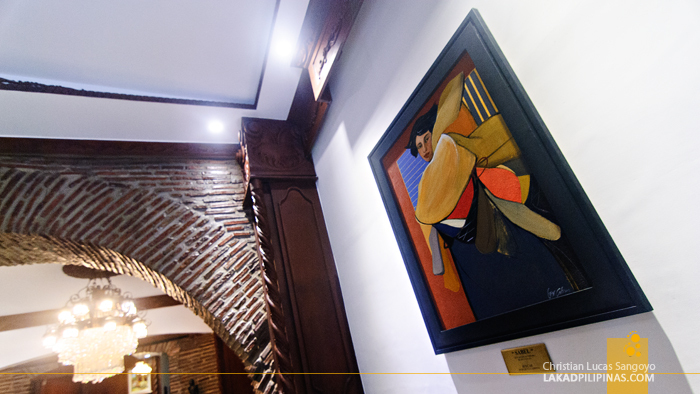 From the Hotel Luna’s foyer, two paintings greeted us; BenCab’s Sabel and Fernando Amorsolo’s Lavandera. 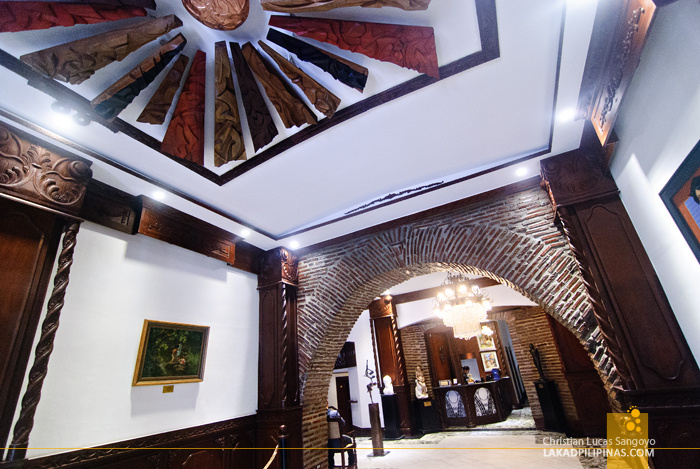 On the ceiling, an intricate sculpture made from various indigenous hardwoods by Mulawin Abueva depicts a hanging sun. Our jaws were starting to hang too. But before it totally reached the floor, a guide smiled at us and asked if we’d like a tour. Free of charge. Did he just say free of charge? That did it, we were totally blown away. Our jaws littered the hotel floor. 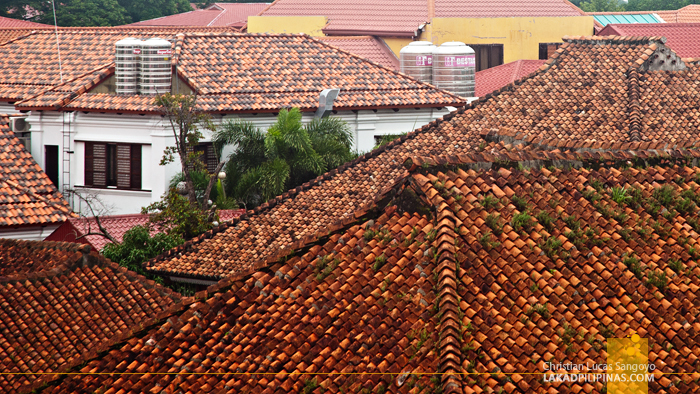 Hotel Luna, like most accommodations in Vigan City is a former Spanish colonial house. 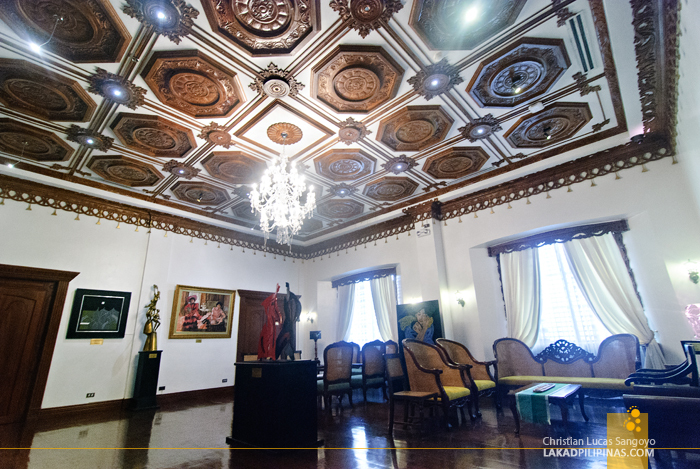 Built in 1882, the house was a wedding gift by affluent Ilocano, Don Jose Florentino, to his daughter. Through time, the house has deteriorated to the point that some locals even refer to it as a haunted house. Then came the AHM group. 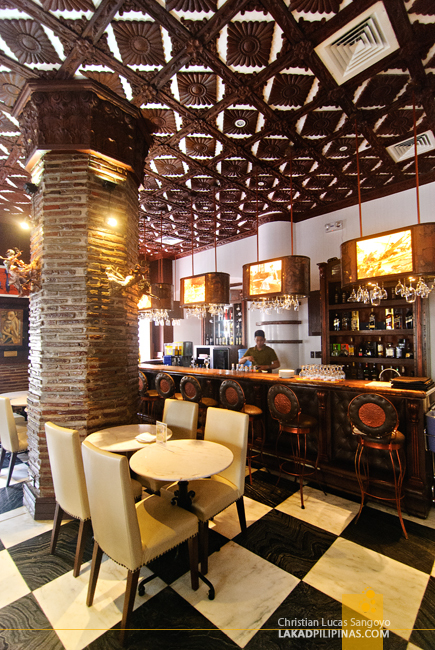 Last year, they reopened the Encarnacion ancestral house and rebranded it as Hotel Luna. These are the same guys who manage Baguio’s Le Monet Hotel and Manila’s Hotel Rembrandt. 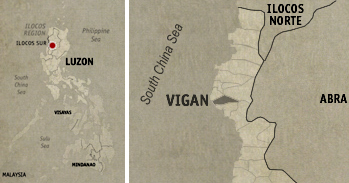 And from such names , you can expect that their new lodging in Vigan would also be art-inspired. If we thought that the walls (and even ceiling) of the hotel’s ground floor was already filled with all sorts of artworks, we were wrong. 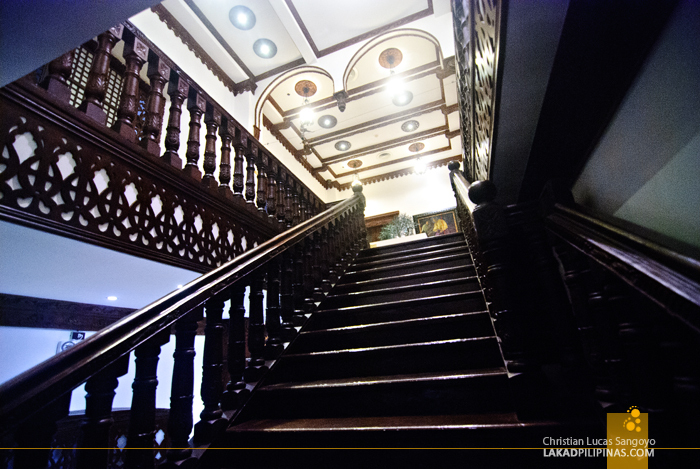 As we ascended Luna’s grand staircase towards the second floor, we were even more impressed. 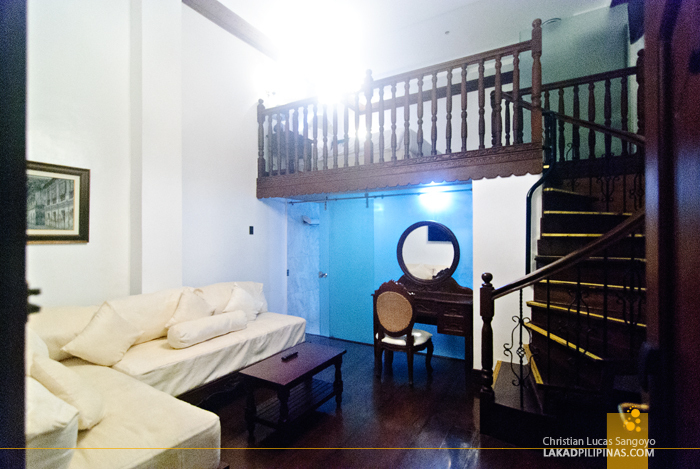 The former sala or living room of the ancestral house is where the action really is. Paintings and sculptures from the who’s who of Philippine arts is here; BenCab, Napoleon Abueva, Ronald Ventura, Arturo Luz, Malang, Vicente Manansala, Federico Alcuaz, Guillermo Tolentino, to name just a few. And there is of course, Juan Luna. 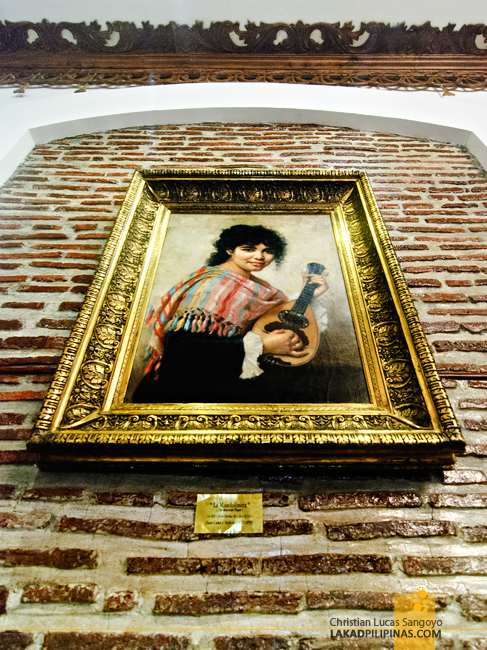 Two of his works are displayed at the Luna Hotel; a small untitled sketch done in 1800 and the La Mandolinera or The Violin Player, an 1883 piece. I searched high and low for the origins of this painting but I can’t seem to find it mentioned in anything related to the great Filipino painter. The thing I found, however, was a bit controversial. A certain Francine Charderon, a French painter who lived in the 1800’s has a similar painting titled Gitane à la Mandoline, dated nine years after the supposed Luna original. I’m no expert when it comes to art history nor its authentication, I leave the speculations up to you. Our guide, Iron, graciously stop at each artwork and knowledgably explains each piece to us. Note that these guys are not full-time museum guides, they’re part of the hotel staff and touring guests is only a part of their job. 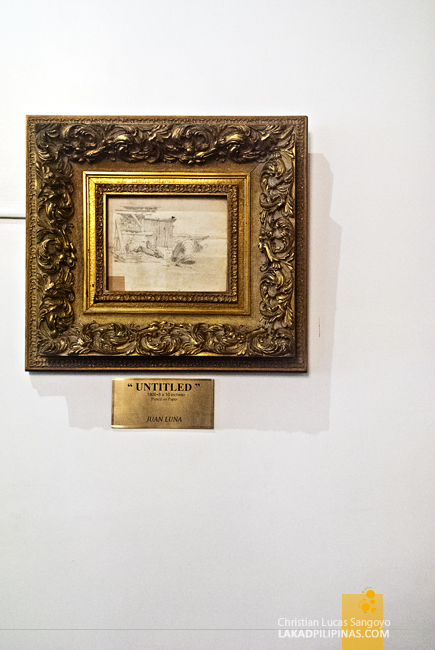 Their knowledge on the artworks displayed inside the hotel is impressive, and they have no cheat-sheet either. After showing us Hotel Luna’s collection, he then proceeded to tour us around the hotel. 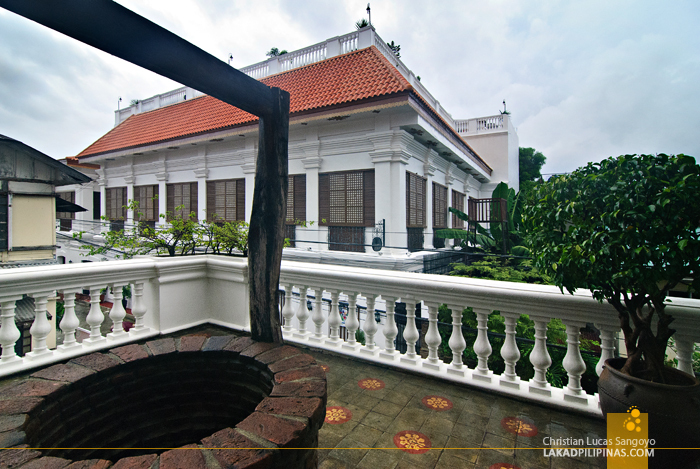 Right next to the ancestral house, they added a new wing where more rooms are situated. 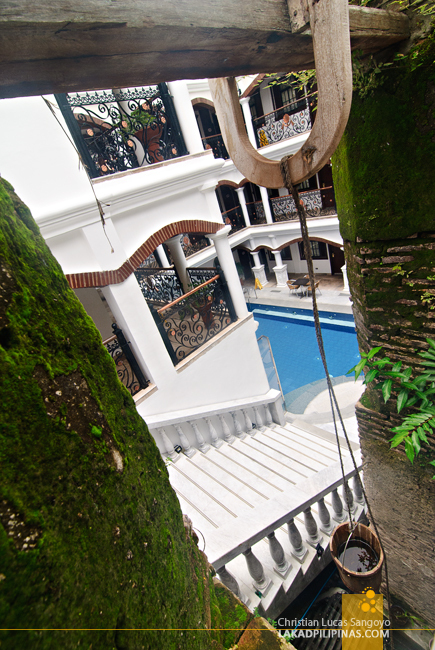 In its courtyard, a swimming pool sits quietly, awaiting visitors to take a dip. We were of course not allowed to do so, since we were really not hotel guests. But that changed as soon as the rooms were shown to us. Hotel Luna’s rooms are as grandiose as one gets; four-poster beds, hardwood floors, antique furniture, grand chandeliers. And don’t get me started on their toilet and baths. Right there and then, we immediately decided to extend a day more in Vigan. We requested for their Loft Suites (check rates). It’s good for two but we were five in the group. We begged if some of us can just sleep at their sofa; they graciously allowed us to. Sweet suite! The room has two en suite toilet and bath, one for the loft and another very spacious one on the lower level. 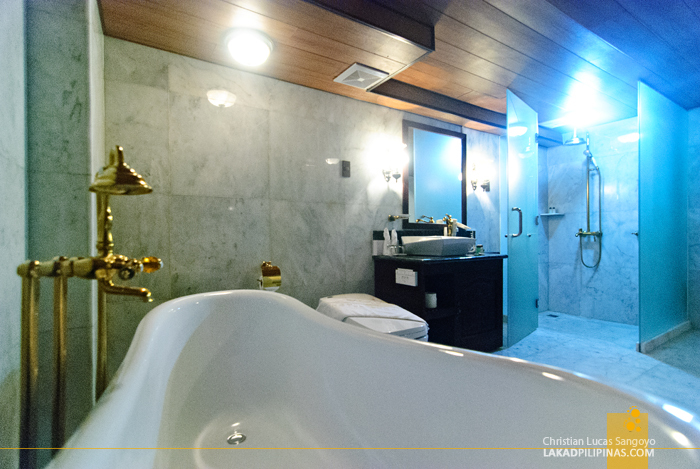 It has an old-school bath tub and a rain-type showerhead. The fittings are tinted in gold too. But let me get a bit more detailed. I was totally blown away by their water closet. It is state-of-the-art! 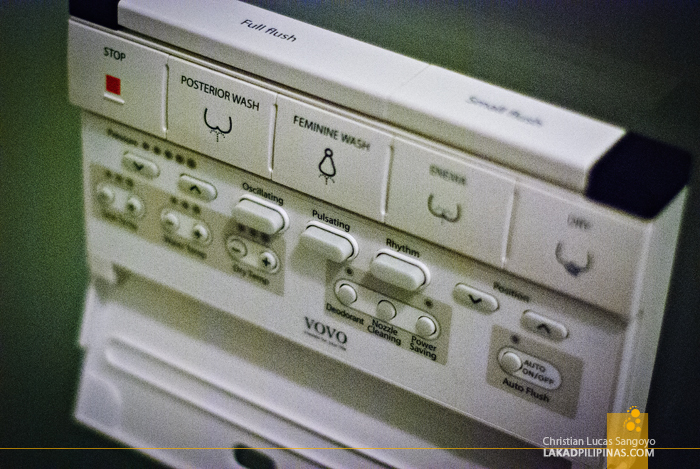 It’s all digital, with all sorts of settings for washing your behind (or posterior, if you must). The only place I’ve only seen these kinds of toilets are in Tokyo. A breakfast buffet is also inclusive with the room. 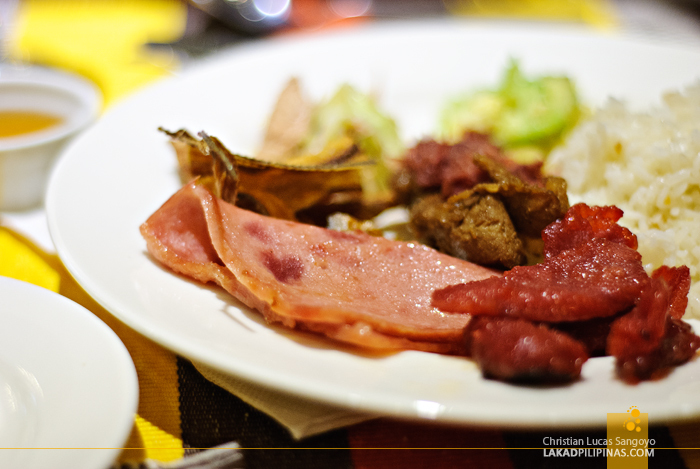 They serve the usual Filipino fares like longanisa, tocino, tapa, danggit, and sinangag. For those wanting something a bit more local, they also have selections of Ilocano dishes. All those are well and good, but breakfast is incomplete without bacons, good thing they have some too! While enjoying my breakfast, I can’t help but ogle at their dining hall. Huge paintings also dot its walls and its intricate ceiling-work is something to behold too. Needless to say, our supposed quick-tour of Hotel Luna quickly became an extended affair. From an hour, our stay stretched for two more days. And for a single night, we experienced how it was like to sleep inside a museum filled with the works of the Masters of the Philippine Arts. It was something not everyone can say they’ve experienced. 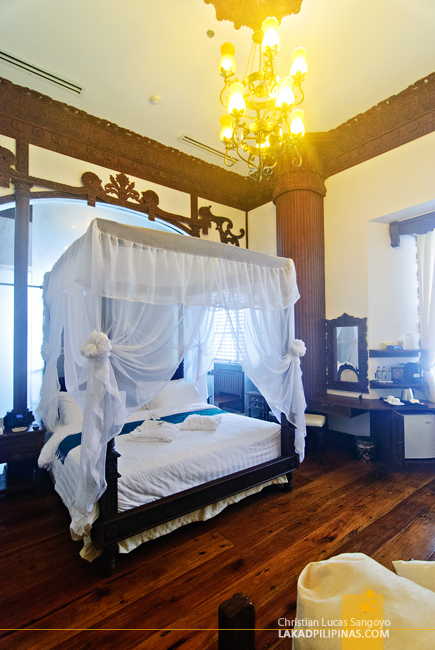 But really, with Vigan’s Hotel Luna, that privilege is now open to everyone who wants to. Wow! I am contemplating on the two hotels but because of this, will definitely choose Hotel Luna, aside from the fact that it's the #1 hotel in Vigan based on Tripadvsior. 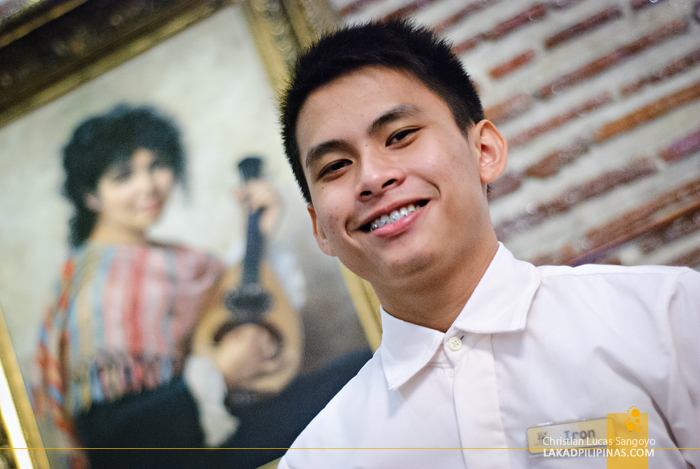 Your pictures are more detailed and indeed such a delight to know that there are original paintings of Luna himself! Excited to sleep in the only museum-hotel of the country! Thanks for this!